Weekly Photo Challenge: Relic | Oh, the Places We See . . .
For us, the word relic seems linked to the phrase from the past. So, when we were driving through Spokane hunting for antique stores and came upon this farm relic from the past, we couldn’t resist stopping by for a closer look. Where had this old guy been? What crops had it seen in better days? What stories could it tell? All unanswered queries, of course, but this old relic has present-day charm for those of us who love faded glory, peeling paint, and the encroachment of rust. You just can’t beat relics of the past for reminding us that there were other times with other useful instruments, and some of what we know and use today will be relics in the future. For more relics, click here for the WordPress Weekly Photo Challenge: Relic. This entry was posted in Photography, Weekly Photo Challenge and tagged antiques, photography, postaday, tractor. Bookmark the permalink. I love this one. Amazing what the right angle does for something that would otherwise look half-dead. Perfect choice for the challenge Rusha! Thanks so much! 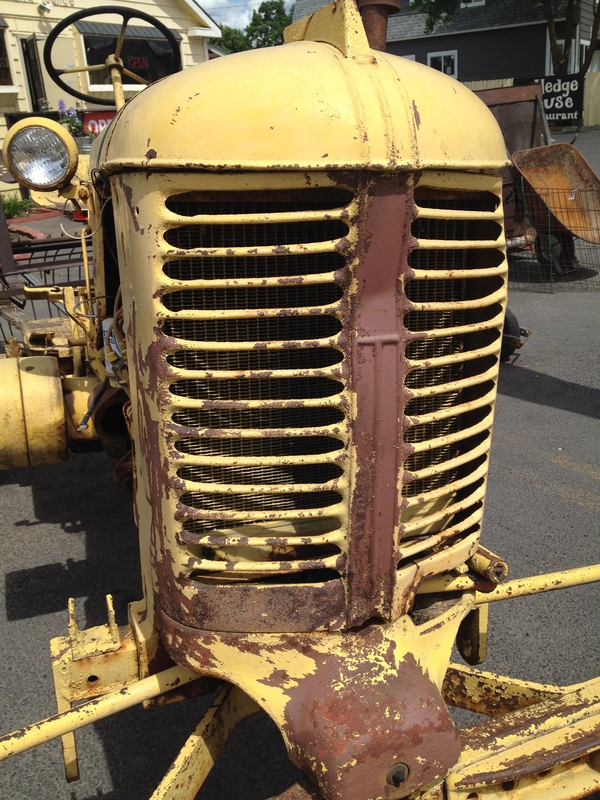 I love poking around antique stores, and this old tractor was right on the sidewalk just screaming out for me to take its picture! Glad you liked it! I’ve never driven a tractor, either, but I’d love to. We saw several in the fields of The Palouse in eastern Washington state, and it didn’t look easy to navigate any of them. We also have lots of rusty farm implements here in America — and most have great stories to tell!! Thanks for commenting. So very true, Rusha. I love your pictures of this relic. I wish I had been there with you to have taken some of my own. We love antiques, but I’ve just started photographing some of my favorite shops. More to come, I hope.Thanks for reading.